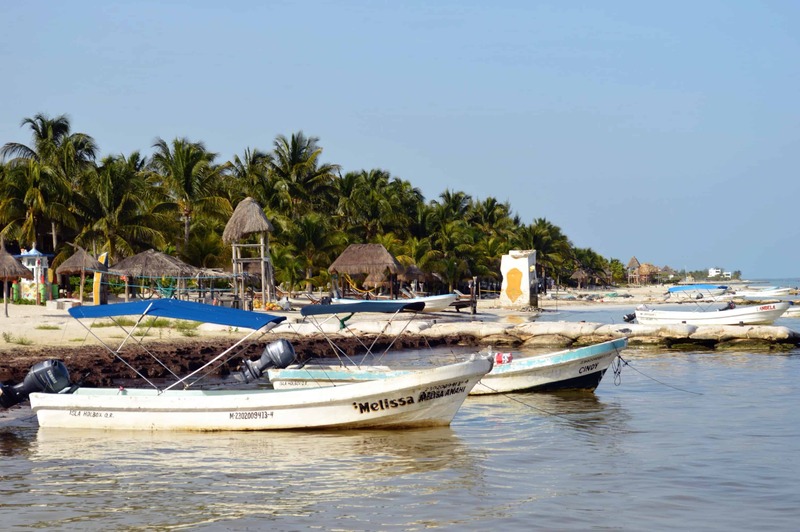 If you’re already planning a trip to Cancun or the Riviera Maya then Holbox Island is an easy trip to tack on. 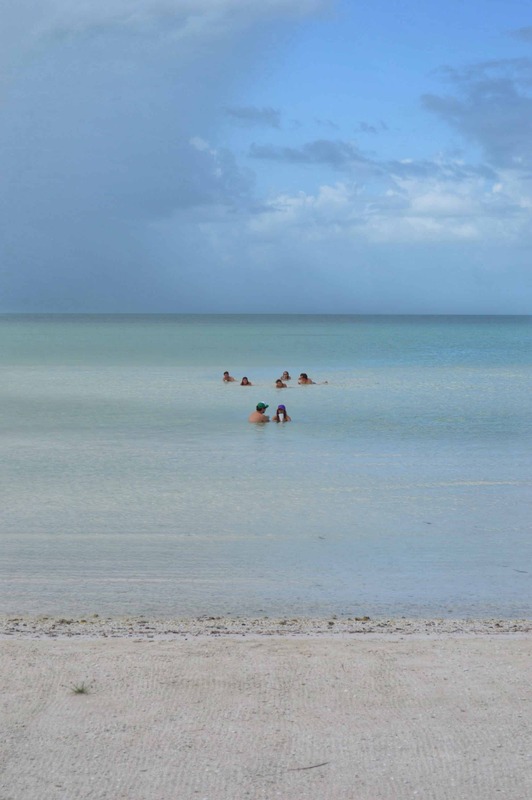 Much of the Riviera Maya has incredible beaches and Holbox is no exception. The island has white sand beaches and knee-high, crystal clear waters that stretch for hundreds of feet before dropping off into the ocean. But unlike Cancun, Isla Holbox is incredibly tranquil, slow-paced and is an off-the-beaten path destination. With the exception of Mexican tourists, it’s relatively unknown to North American travelers and is only moderately visited by Europeans. It’s undoubtedly beautiful, peaceful and amazing without being spoiled by the massive crowds of spring breakers and resort-seeking tourists just trying to escape their office jobs on their yearly vacation. There are a few ways of getting to Isla Holbox depending on your budget, language skills and sense of adventure. And if you’re one of the few who actually make the trek, your dedication will be rewarded since not many know of the island nor take the time to go. 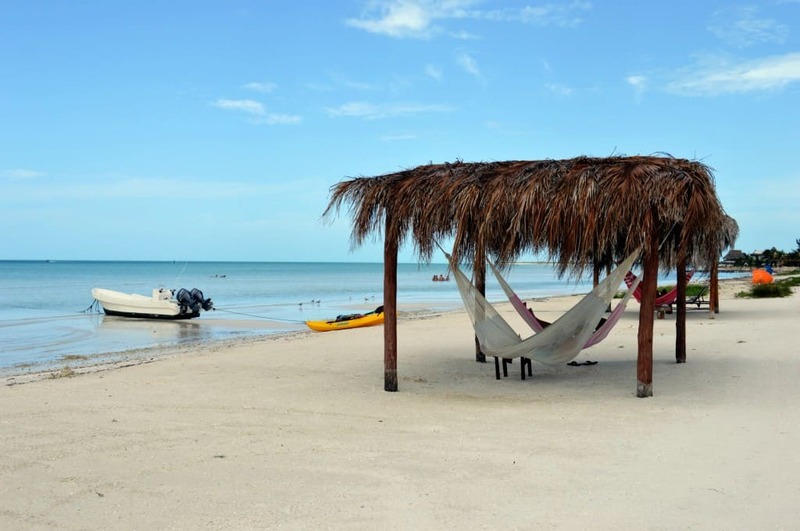 Surprisingly, Holbox has its own airport – or rather a dirt landing strip on the edge of the island. If you have the cash and are short on time, you can actually take a small plane from the Cancun airport direct to Holbox Island. But with the added cost and transit time from the Cancun airport, I doubt you’ll save more than an hour’s time compared to going by land. The most common route is to book a private van transfer from the Cancun airport or your local hotel. Travel in Mexico tends to be low cost so the private transfers aren’t very expensive and the added convenience of direct pickup is helpful. After a two hour ride, you’ll arrive at Chiquila, a small fishing village where you take a ferry across the lagoon to the island. The ferry runs every 30-60 minutes, costs $80 pesos (~$6 USD) each way and takes about 20 minutes to reach the island. Our local host VIP Holbox offers transfers for $35 USD per person including the pickup, ferry ride and taxi to your hotel. The third and more adventurous route would be to skip the private van transfer and go from Cancun to Chiquila on your own via public bus. 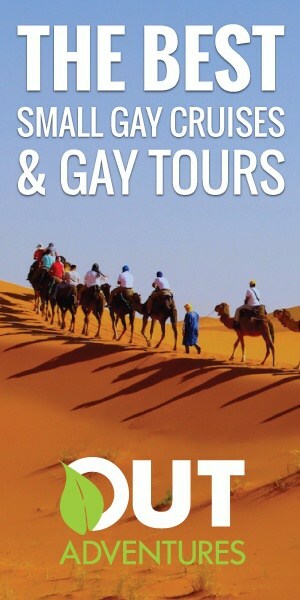 This is the lowest cost route though it’s best for more experienced travelers with some basic Spanish language skills. You can catch the bus from the central bus station in Cancun. The trip will take 2-3 hours and will cost around $100 pesos (~$7 USD) each way. Don’t expect to find the high end, Las Vegas-style luxury resorts on this small island like you would in other destinations in the Riviera Maya. But with more than 60 privately owned properties, you’ll find a place to stay on any budget. If you’re a backpacker, there’s a hip and stylish hostel located right in the center of town called Tribu Hostel Holbox with rates as low as $10 USD for a shared room. They even offer Spanish courses if you decide to stick around for a while. You can find more luxurious rooms at beachfront hotels like Las Nubes de Holbox or Casasandra Boutique Hotel, which offer private swimming pools, fine dining and spa services onsite. I stayed at a small mid-range property called Hotel Casa del Viento which offers rooms ranging from $40 to $100 USD per night depending on the season and room type. The owner himself actually prepared my breakfast cooked to order and even mentioned his intention to join the IGLTA (International Gay and Lesbian Travel Association) and position his property as gay-friendly. There’s plenty of tasty food to find all over the island, but the specialty here is definitely fish. 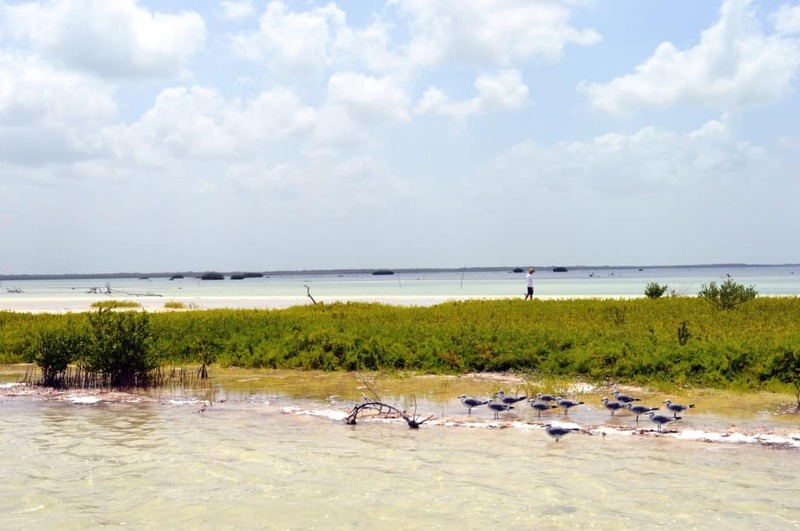 Isla Holbox is after all, a small fishing island and has only recently shifted its focus to tourism in the past 15 years. But if you’re in the mood for tacos, you can’t go wrong with El TacoQueto. Ask almost anyone on the island where the best tacos are and they will point you to this place. It’s a local taco shop off the main square with no frills and outdoor seating. You can also try another local favorite called Pizzería Edelyn where the specialty is the lobster pizza. If you’re looking for a more upscale and swanky dining experience, Las Nubes at the far east end of the island offers delicious al fresco dining right on the beach. We ate here for lunch and enjoyed freshly prepared ceviche along with their amazing tamarindo margarita. Actually, the margarita itself is reason enough to go and I’m not ashamed to say I drank four at lunch. Casa Sandra is another upscale option with fine dining, an intimate environment and nice wines. But regardless of where you choose to eat, you absolutely cannot leave the island without trying the ceviche at least once, which is always made fresh with the catch of the day. The beaches on the island are a natural draw but there are many more things to do depending on the season including fishing, kayaking, snorkeling, kite surfing or wildlife excursions. High season here ranges from May to September so some of the adventure and wildlife activities are only available during this time. But with the warm tropical climate, off-season is still worth visiting and you’ll enjoy empty beaches and reduced prices. Holbox is famous for whale shark excursions and its population of flamingos but you won’t find either in off-season. When the local guides aren’t taking you a on a boat tour during the high season, there’s a good chance they are fishing the waters to feed their families, making a living by selling to the local shops and restaurants. All the fishing here is small-scale and done by hand – literally! We even went out on a boat and tested our luck at fishing using this method. Just unwind the line from a spool, load up with some fresh bait and drop it into the water holding the line directly in your hands. We managed to catch about 15 medium sized fish and our guides from VIP Holbox prepared the best ceviche I’ve ever tasted right there on the spot. 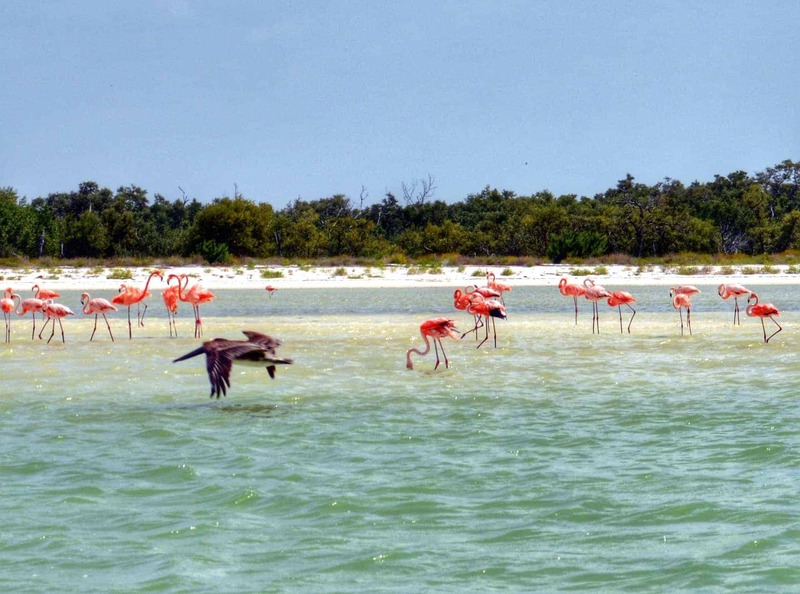 Probably one of my favorite parts of the trips was seeing the wild flamingos as we returned from our fishing trip. These magnificent birds are located at Mosquito Point on the north side of the island, just east of the main town. But since the birds are heavily protected, you can’t get close on land so best and probably the only viable vantage point is from a boat. When you arrive at the Holbox Island port you’ll immediately notice the complete absence of cars. Most locals get around by bike or by foot given the island’s small size, but you’ll also find golf carts all over the island and you can rent one exclusively or take one as a taxi to move around if you’re going to the other side of the island or just not in the mood to walk. 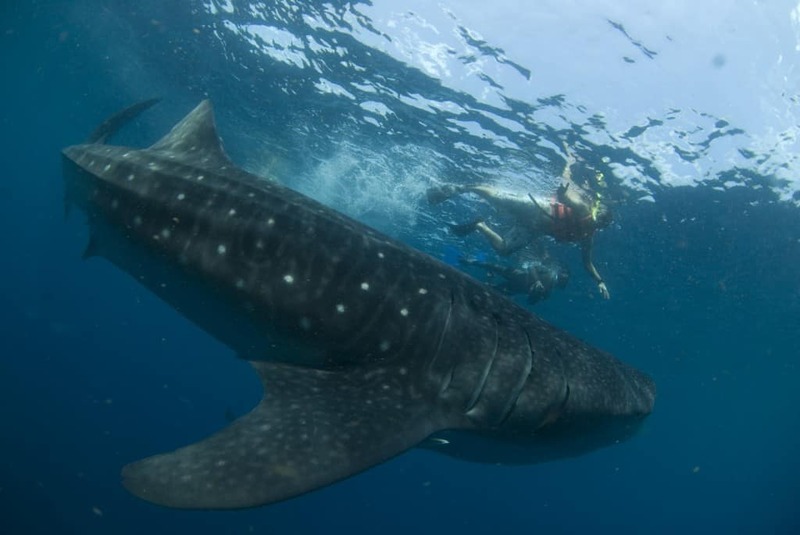 Isla Holbox is one of just a handful of places in the world where you can swim with whale sharks. These docile creatures are the largest species of shark and migrate to the area each year to feed on the plankton that thrives in the waters just off the island. This activity will probably be one of the highlights of your visit, but you should plan ahead and be flexible in case your excursion gets canceled due to weather or bad sea conditions. The ocean is unpredictable so if you’re dying to see them you should make several days available in your schedule. In February of 2012, a group of Canadian artists were invited to the island to create a series of murals around the town. 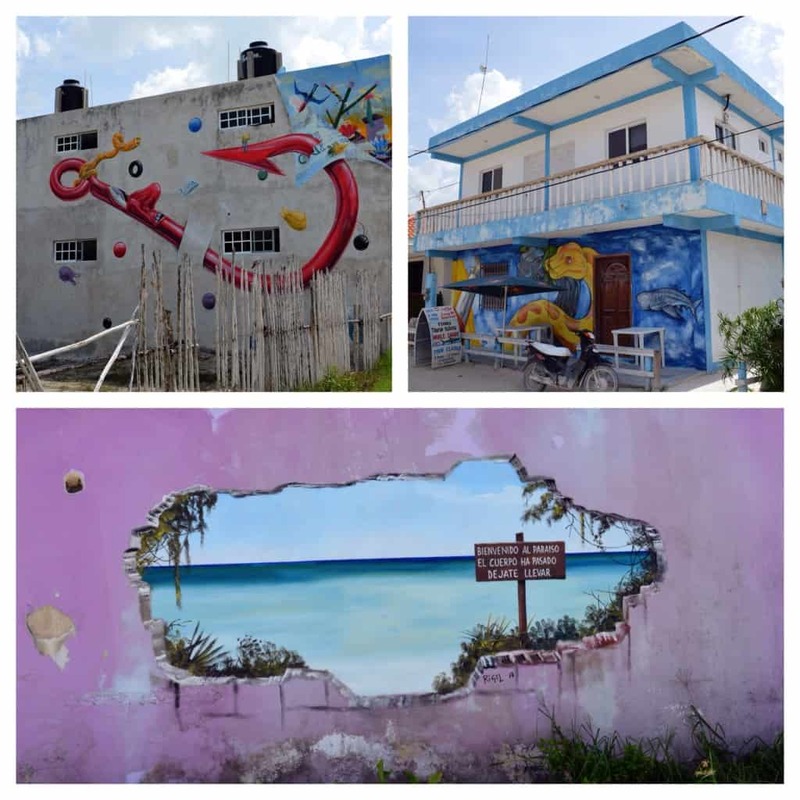 They spent a week touring the island to gain inspiration for their work and now you can enjoy a mix of street art painted on the sides of buildings as you walk around town. The project adds a touch of creativity to the island and reinforces the casual feeling and beauty of the island. Isla Holbox was one of the best destinations I’ve visited this year and I would argue it might be the best Carribean Island to visit. I had mixed feelings about Cancun itself but Holbox Island alone makes the trip to the Riviera Maya worthwhile. The serenity of this tiny island and slow pace mixed with the multitude of water and wildlife activities made it an incredible destination to connect with nature and relax on some of the most beautiful beaches I’ve ever seen. What intrigues you most about Isla Holbox? Does it seem like a destination you’d want to visit? Let us know in the comments below! Note: My trip was provided by the Cancun CVB as part of my participation at the TBEX travel blogging conference but I can assure you all opinions are 100% my own. In fact, I would happily return to Isla Holbox on my own dime and I would encourage anyone who’s looking for a tiny piece of paradise to do the same. Looks pretty nice Austin, although we’ve spent 6 weeks here… we still didn’t get to Isla Holbox. So much water, sand and beauty here – loving it. Ahhh too bad. It’s such a great island. It’s close but just far enough away that most people don’t make the trek. Is that a good or bad thing Ed? I would do just about anything to be on a warm beach right now. All this new cold rainy weather in Madrid is killing me! This looks so peaceful! … Well all except that scary looking “whale shark.” DOn’t know if I’d be caught dead swimming next to that thing! A beach does sound great…doesn’t it?! And the whale sharks are amazing creatures! They are incredibly slow and docile. Though I’m sure it will still be a bit nerve racking to actually swim with them…that is, when I finally get the chance. I’ve never heard of the island, but I definitely want to go! 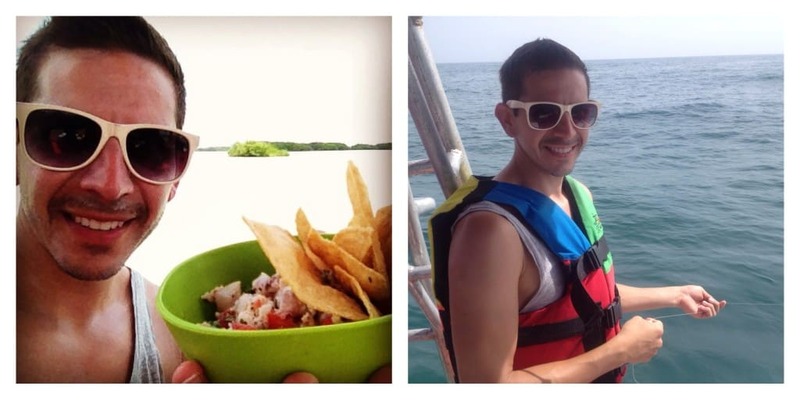 Flamingos, clear water, ceviche… i’m in! It also sounds like a pretty safe destination where you’re mixed in with the locals, is the true? …unlike cancun where you’ll never leave the resort. It’s amazing! Totally safe and totally unlike Cancun in almost every way. Best, and look forward to lots more from you! Thanks Toby! Hmmm, you could be right. After all, we didn’t name ourselves two good tourists for a reason ;-) Though actually the waters on Isla Holbox were amazing! I have been going to tulum every year for the last 3 years. 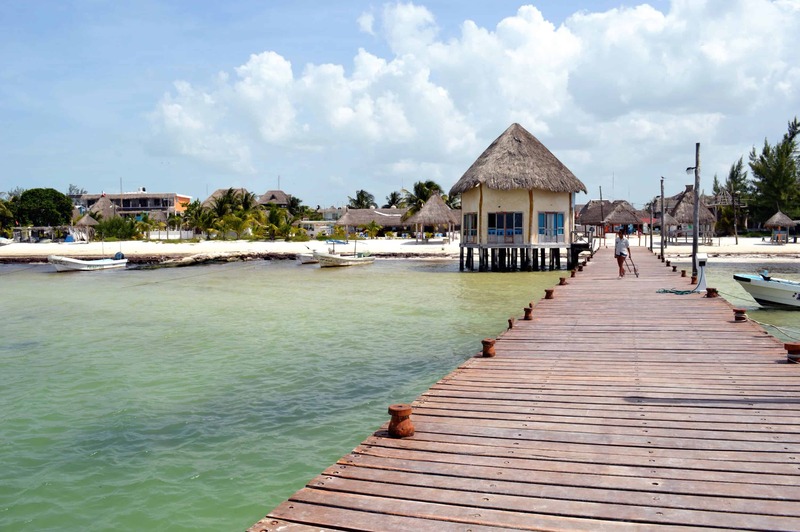 I love it although holbox does look amazing I’m now starting to be tempted to go there this year instead. Auston what was the evenings like in holbox? I’m not looking for a night club but I do like being able to walk to a bar here or there in tulum and be around a few people. Yes there is definitely life in the evenings on Holbox. It’s touristic island so there are plenty of people around. True…I think the size we mention refers to the inhabited part.